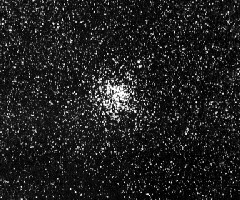 Messier 11 (M11, NGC 6705) is "One of the richest and most compact of the galactic (open) clusters," to say it with Robert Burnham, Jr. M11 contains an estimated 2900 stars, about 500 of which are brighter than mag 14. 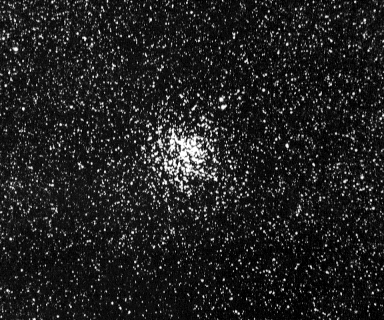 An observer at the center of M11 would see several hundred first magnitude stars! So rich and dense, it was classified by Trumpler as II,2,r (some newer classifications have it as I,2,r). The apparent diameter is given with discordant values; E.E. Barnard estimated 35', while the Sky Catalog 2000 gives 14'. The age of the Wild Duck cluster has been estimated to amount 220 million years, as its brightest and hottest main sequence stars are of spectral type B8 (according to the Sky Atlas 2000), but also double that value (Burnham gives 500 million years). The higher value is supported by the fact that this cluster also contains many yellow and red giants of absolute magnitude around -1.0. G. Meynet's Geneva Team has recently calculated its age at 250 million years. It is receding at 22 km/sec. M11 was discovered by the German astronomer Gottfried Kirch of the Berlin observatory in 1681. It was apparently first resolved into stars by William Derham about 1733. Charles Messier included it in his catalog on May 30, 1764.